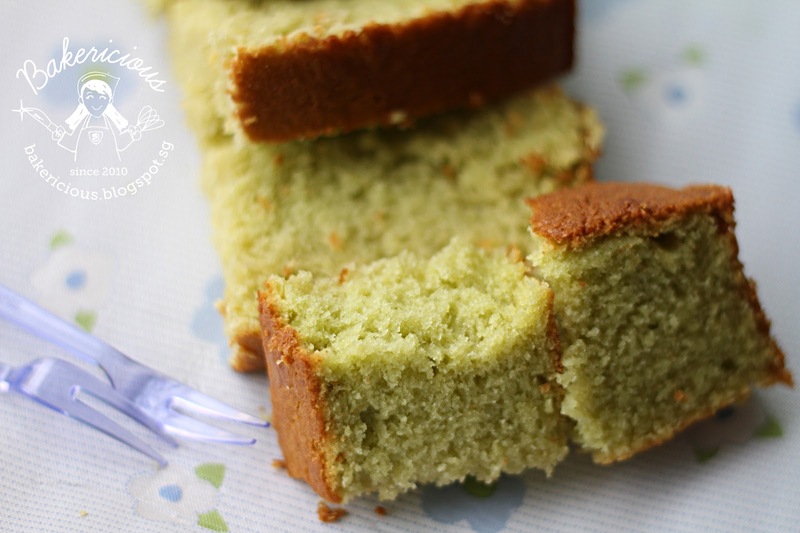 I like all sorts of pandan cake, be it pandan chiffon or pandan butter cake. When I spotted this cocopandan cake from Table for 2 or more, there is no doubt at all for me to bake one since I cannot resist pandan cake. As usually, I didn't bake it immediately, it took me more than a year before I finally have chance to make it happened lol. Initially I thought of using coconut milk to replace the evaporated milk but finally decided to follow exactly from the recipe to try the original taste. * I used 8 pandan leaves and blend with water, left the juice in the fridge for 3 days to get the concentrated pandan juice. The total amount of thick layer of pandan extract and the upper layer of diluted pandan juice added up to be 185ml. 1. Preheat oven at 160C. Line and grease the cake pan. 2. Combine milk with pandan juice and set a side. 3. Beat (B) until stiff peaks form and set aside. 4. With the same beaters, beat butter and sugar until light and fluffy. Add in egg yolks, one at a time, beating well and scrape the bowl after each addition. 5. Put in 1/2 portion of step 2 and beat until well combined. Put in 1/2 portion of flour and mix. 6. Put in balance of step 2 and mix, fold in the balance of flour and mix well. 7. Add in dessicated coconut and mix well. 8. Fold in beaten egg whites in additions. 9. Pour batter into the prepared pan and bake for about 50 mins or until the skewer comes out clean. The outer layer of the cake is a bit hard, I must have over baked the cake. 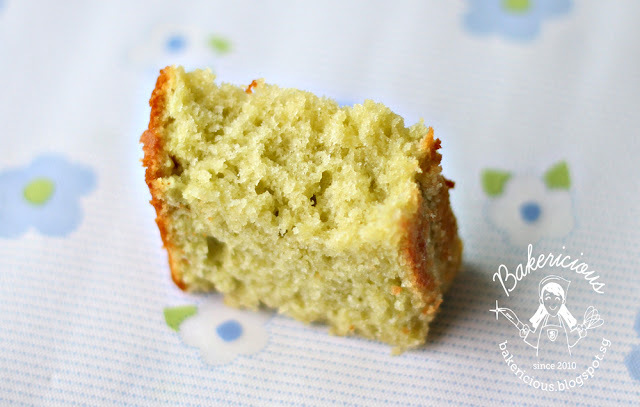 The inner texture of the cake is soft and moist with the bites of dessicated coconut really delicious. The sweetness is alright for me but the sugar still can be increased a bit e.g. another 10g. Next time, I am going to try it again by using coconut milk instead. Hi Jess, I would love to take a few bites of your cake from the screen. The photos capture the softness and fluffiness of the cake so well. This recipe sounds very nice, would love to give it a try. Mich, the cake is really nice, do give it a try. 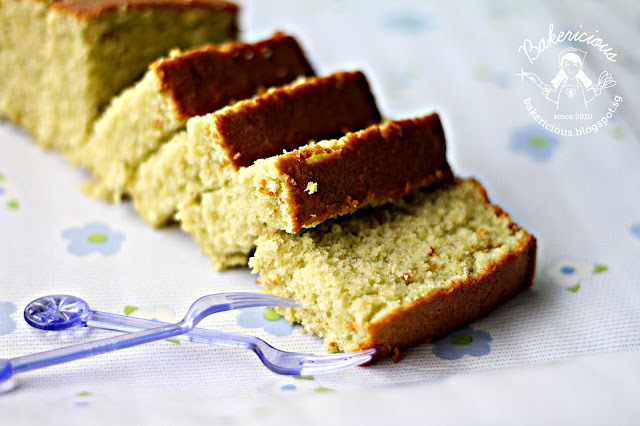 Ann, if you like pandan and coconut, you will like this cake. Same here. Love all kinds of pandan cakes. Both of the fragrance and the colour are unique. I always think that Wendy is always good in baking and cooking the best of Asian-style of cuisine. your watermark is so cute!! pandan + coconut, they are a perfect combo! 2 hungry tummies, oh I love everything pandan too :D.
Wiffy, I am back only 2 months ago, didnt see much updates from you too. Sonia, totally agree with you. Jess I am kiving this one. Looks so moist. Mmmm....looks very moist and delicious. I love the smell of pandan too. I think it would taste awesome if you use coconut milk. Jess, go for it :D Thanks very much for sharing this lovely cake. Beautiful and tasty cake...love the texture of it. Oh yes, Bee Bee, I like coconut in my bakes heeheehee... and you are right, anything with coconut sure very 香.
Edith, ve to try this if you like pandan & coconut. Mary, yes will definitely go for the next bake with coconut milk. Hi Mary, yes you are right that the cake tasted good :). sounds like a delicious cake! i can see that the texture is lovely! My name is Hui Li recently asked you a number of question under Anonymous cos i can sign in my google account. I have my pandan juice ready in my fridge, about 1 cup but and nicely separated into 2 layer, so i use only the dark green bottom or together with the light green layer to get the required amount? Hi Hui Li, yes I used both the pandan extract (the thick layer) and pandan juice (the diluted upper layer)to get the total amount. Ahhh... long time never eat this cake. hehehehe. Hmm... did u cut the cake immediately? or sometime later? if u wait longer, the top will be softer. Usually I wait few hours before I cut my cakes. This way less crumbs too. Hi Wendy, I cut it the next day. Hi, I had stated in the ingredients list that I was using dessicated coconut, means dried coconut. Hi Gina, I used about 180ml of water if I remember correctly. You need to blend the pandan leaves with water, squeeze out the pandan juice. You can choose to use the pandan juice immediately or you can leave the pandan juice in the fridge for a few days to get the pandan essence/extract, means the bottom darker green layer of the pandan juice plus the upper layer more diluted pandan water. Jess, check with you, the 3/4 cup dessicated coconut, the 1 cup = how many gram? Hi I am not too sure as I didn't weigh it but may b u can aga aga?